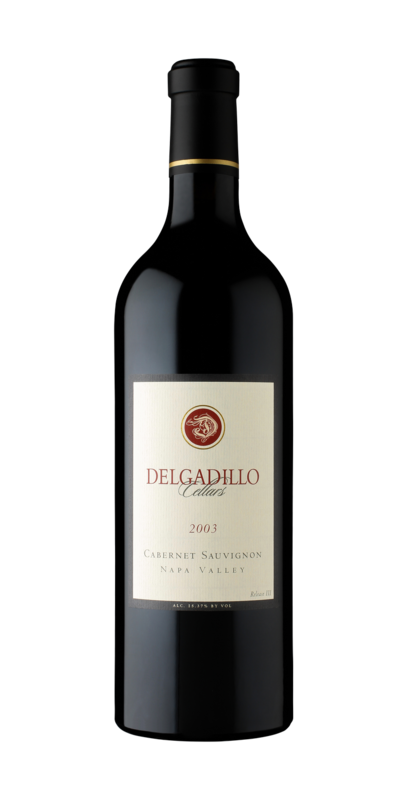 With 20 months in barrel and over 5 years in bottle, the 2003 Delgadillo Cellars Cabernet Sauvignon has been beautifully aged in ideal cellar conditions before its release. A fantastic vintage with only 163 cases produced. Aromas of liqueur de pruneaux and cinnamon punctuate the nose dominated by red fruits. In the mouth, look for intense flavors of fresh red fruits and caramel overlaid by well-integrated oak tones. Vineyard Notes Grape SourceThis wine was sourced from Mill Creek Vineyard, situated on the west side of the Napa River, midway between St. Helena and Calistoga on the northern end of the Napa Valley. Cabernet Sauvignon vines were planted on the gently-sloping 2 ½-acre site in the early 1970s. Meticulously hand tended, the vines are spur pruned and ladder trained. The site is completely dry-farmed, and annual tonnage ranges from 2.5 to 4.5 tons. Winemaker Notes Winemaking TechniqueGrapes were harvested in the cool early morning hours to ensure clusters arrived at the press in near perfect condition. After destemming, a whole berry fermentation lasted 8 days before a gentle basket press separated wine from the skin cap, capturing nearly free run juice. After malolactic inoculation, the wine was transferred into French oak (50% new) for 40 months.